The Bahamas Tribune wrote today that Disney Cruise Line has told them they are no longer interested in developing Egg Island into a private island port. Disney said their impact studies show the island's marine environment could not survive undamaged given the operation the size Disney would be creating on the island. Carnival is partnering with Build-A-Bear Workshop to bring the retail entertainment experience aboard each Carnival ship by next summer. It will also act as a fundraiser for St. Jude's. On the eve of Eurodam's scheduled overnight call at Istanbul, Holland America Line said today they have decided to cancel all calls at Istanbul through the end of the year. The Miami Herald reports that Disney Cruise Line is considering acquiring and building a second private island in the Bahamas. Reports say the line is considering the 12-acre Egg Island off the north end of Eleuthra. Princess Cruises's Princess Cays is on the south end of Eleuthra. Details appeared in the July 21 edition of Cruise News Daily. Residents of Rostock (Germany) are doing a double-take. 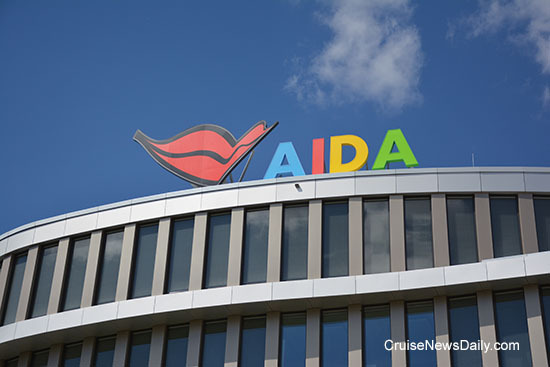 AIDA Cruises moved into their new headquarters building, and yesterday they added their logo to the roof of the building: a giant lighted pair of red kissing lips. Actually there are two, so they can be seen from both sides of the building. They are more than seven feet high and fifteen feet wide. The logo adorns the bows of all eleven ships in the fleet, but these are larger than any on the ships. Four crew members from Norwegian Breakaway were injured today as a result of an accident while the ship was alongside in Bermuda. Empress of the Seas, which recently rejoined the RCI fleet after being operated by Royal Caribbean's Pullmantur brand, had a little trouble passing its latest US Vessel Sanitation Program inspection last month. It scored only 80 points, and it needed 85 points for a passing grade. Proving the case that norovirus isn't just found on cruise ships, 13 members of the California delegation to the Republican National Convention were stricken with the illness this week and asked to isolate themselves in their hotel rooms. Last week we reported on two situations, both in the Mediterranean, which caused cruise lines to change their itineraries on very short notice due to circumstances in ports. Today, we are seeing an instance of a cruise line move a ship on a year out due to expected shifting demand. Today, Celebrity Cruises said they were moving Celebrity Equinox from its planned western Mediterranean program next summer to the Caribbean, allowing the line to offer a year round Caribbean program. The complete story appeared in the July 19 edition of Cruise News Daily. P&O Australia is expanding at Brisbane next year with the addition of Pacific Aria being based there, so it's only natural that they want the ship currently based there, Pacific Dawn, to be spiffed up to match Pacific Aria, so Pacific Dawn will get a refit in February. 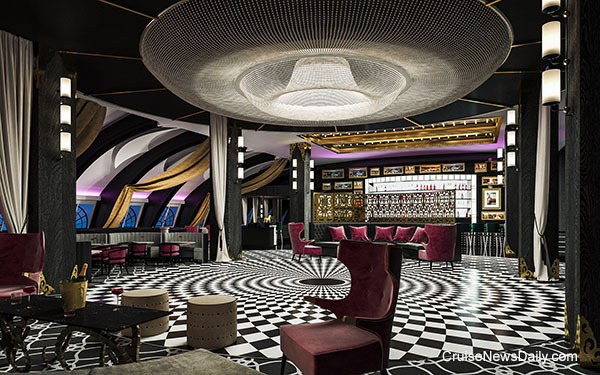 Several public rooms will get the new striking contemporary look which has become a trademark of the P&O fleet. 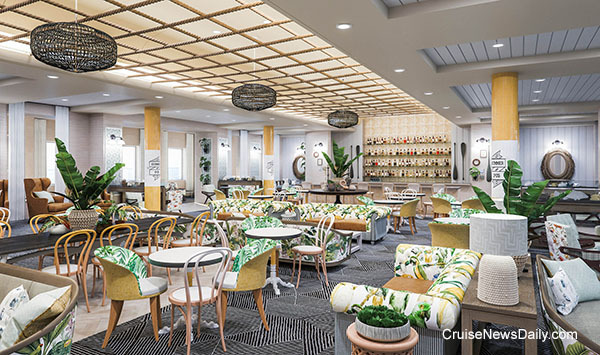 Pacific Dawn's buffet will also be replaced by The Pantry which is becoming a P&O signature feature, and the ship will have the first water slides aboard a Brisbane-based ship. Details appeared in the July 18 edition of Cruise News Daily. Renderings courtesy of P&O Australia Cruises. All rights Reserved. May not be copied or used without permission. Italians going to work in the hotel operations aboard Costa ships soon may be trained in Costa's new land-based school in the prestigious Villa Figoli in Arenzano near Genoa. The line is planning an October opening of the training school for cooks, pastry-makers, bakers, entertainers, technicians, customer service representatives and other positions in hotel and entertainment departments. Rolls-Royce signed a contract to design two polar-class cruise ships that will be built by Norwegian yard Kleven for Hurtigruten. Carnival Corp declared their quarterly dividend of 35 cents per share.